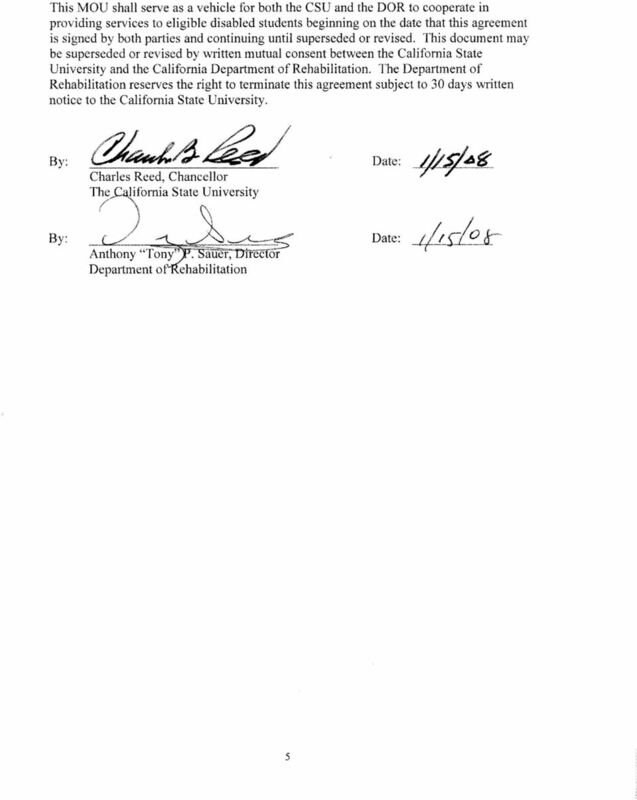 Download "MEMORANDUM OF UNDERSTANDING BETWEEN THE CALIFORNIA STATE UNIVERSITY AND THE CALIFORNIA DEPARTMENT OF REHABILITATION"
1 MEMORANDUM OF UNDERSTANDING BETWEEN THE CALIFORNIA STATE UNIVERSITY AND THE CALIFORNIA DEPARTMENT OF REHABILITATION Introduction This Memorandum of Understanding (MOU) expresses the commitment of the California State University (CSU) and the California Department of Rehabilitation (DOR) to work cooperatively to provide services to eligible CSU studentsldor consumers with disabilities. 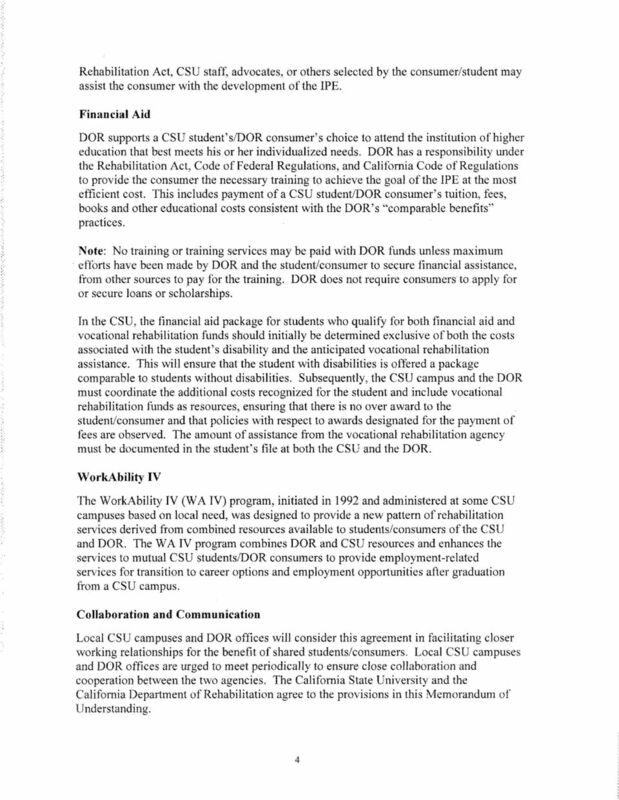 The CSU and the DOR wish to ensure that no qualified persons with a disability be denied reasonable educational accommodations or support services by a CSU campus toward their efforts to create a successful educational experience nor support by the DOR in their efforts toward successful employment outcomes. 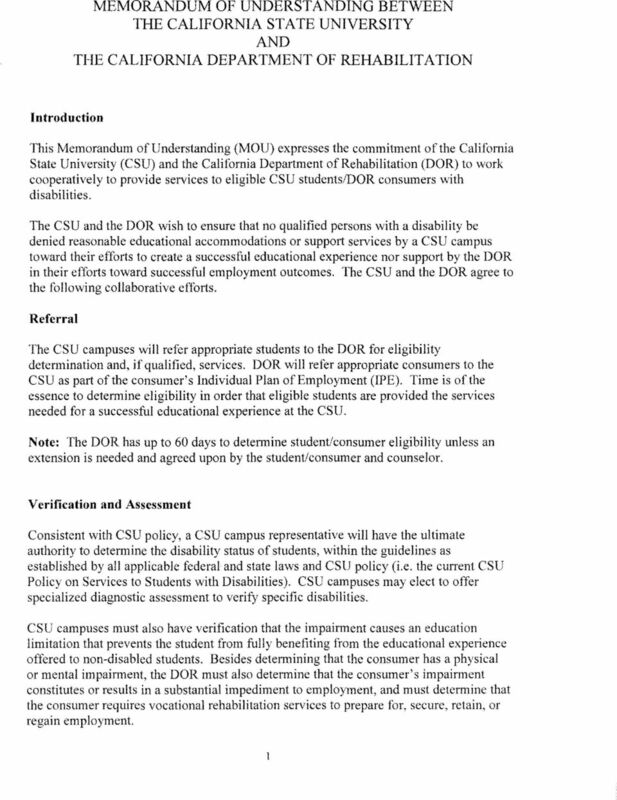 The CSU and the DOR agree to the following collaborative efforts. Referral The CSU campuses will refer appropriate students to the DOR for eligibility determination and, if qualified, services. DOR will refer appropriate consumers to the CSU as part of the consumer's Individual Plan of Employment (IPE). Time is of the essence to determine eligibility in order that eligible students are provided the services needed for a successful educational experience at the CSU. Note: The DOR has up to 60 days to determine student/consumer eligibility unless an extension is needed and agreed upon by the student/consumer and counselor. 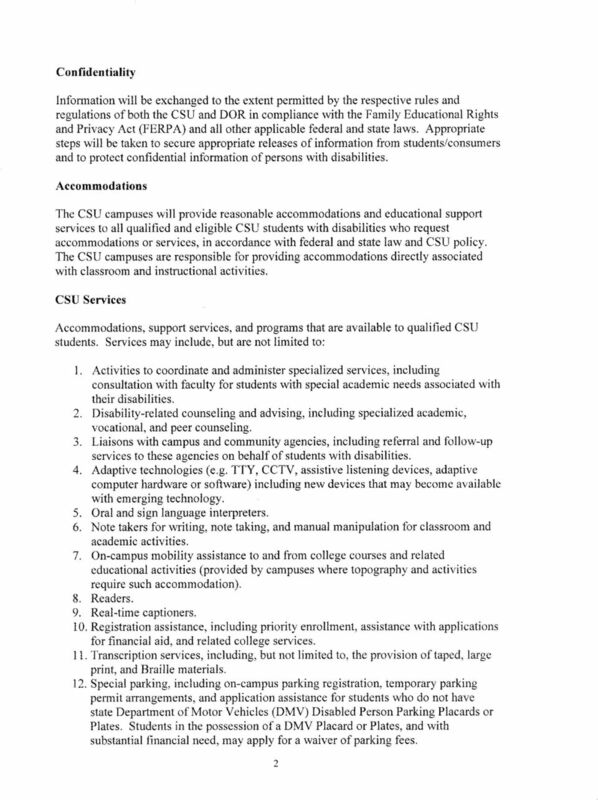 Verification and Assessment Consistent with CSU policy, a CSU campus representative will have the ultimate authority to determine the disability status of students, within the guidelines as established by all applicable federal and state laws and CSU policy (i.e. 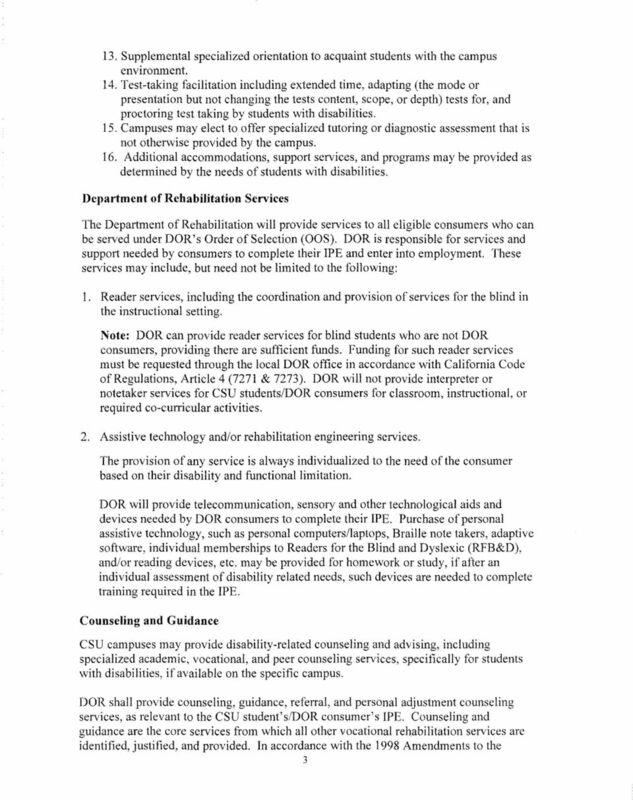 the current CSU Policy on Services to Students with Disabilities). CSU campuses may elect to offer specialized diagnostic assessment to verify specific disabilities. CSU campuses must also have verification that the impairment causes an education limitation that prevents the student from fully benefiting from the educational experience offered to non-disabled students. Besides determining that the consumer has a physical or mental impairment, the DOR must also determine that the consumer's impairment constitutes or results in a substantial impediment to employment, and must determine that the consumer requires vocational rehabilitation services to prepare for, secure, retain, or regain employment. CHAPTER 301 COUNSELING AND GUIDANCE, REFERRAL TO OTHER SERVICES AND OTHER GOODS AND SERVICES Page Section I. Definitions. 2 A. Counseling and Guidance.. 2 B. Referral to Other Service Providers.. 2 C.